As with the first volume the strengths of this book lie in two related things. The first is the width and variety of the sources... The second outstanding strength is the quality and insight of the commentary which weaves its way between the selected sources…as in Volume 1, this volume cannot be faulted in this respect. The informative yet nuanced interpretative views which help link the sources together, tied in with suggestions for what recent literature is worth a further read on that topic, helps bring the reader right up-to-date with present thinking. To help keep things clear, the last 80 pages are general and place indexes, a very good biographical index and a list of all the sources in the book. All in all then, a wide-ranging set of documents and a perspicacious commentary of the final 50 years of a super-power, that we thought was indestructible. Well worth the read. Impresses due to both the sheer volume and variety of documentation—all of which is interspersed with judicious historical commentary. Alternating well-chosen documents with balanced commentary and brief discussions (in footnotes) of relevant secondary sources. Finally, like Volume 1, Volume 2 also includes helpful sections, such as a glossary of Russian words and acronyms, a guide to further reading, a map section (including a map detailing the deportation of Soviet minorities under Stalin), and an excellent forty nine-page bibliographical index. 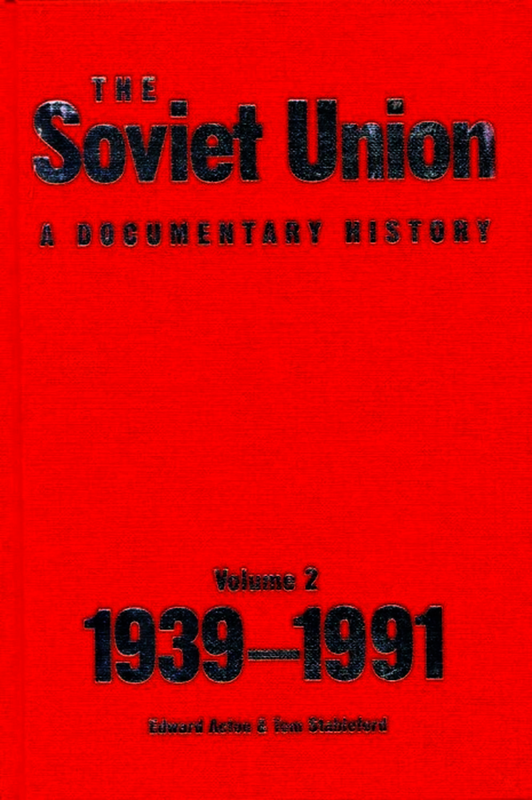 To sum up, then, Volume 2 of The Soviet Union: A Documentary History is an excellent research or educational resource versatile enough to be used in-class either for supplementary primary source reading or as a textbook in its own right. This is an excellent document collection. The intrinsic value of the documents is self-evident. Their arrangement and presentation offer a dramatic depiction of the course of later Soviet History. ...this collection will be extremely useful in university courses, both at the introductory and more advances levels. I can think of no other single collection that can compare. Lynne Viola, European History Quarterly, vol. 40. This is not the first such collection, but it is perhaps one of the most successful and it does an excellent job of giving those who do not speak Russian “a taste of the intellectual feast that is underway” (p. xviii). One of the strengths of this volume is that it gives such extensive coverage to the war and late Soviet period. In addition to the documents, the editors provide lucid, clear explanations of the context in which the document was produced. This volume will appeal to the general reader interested in the discoveries made in the archives since the collapse of the Soviet Union, but it will also prove invaluable for teachers of Soviet history as a welcome and highly successful addition to the source material currently available in English. Edward Acton is Professor of Modern European History at the University of East Anglia, who has published widely on the Russian revolution and the history of Russia and the USSR. Tom Stableford is Assistant Librarian, Slavonic and East European Collections, Bodleian Library, Oxford.